Health and Human Services Secretary Alex Azar talked Friday about the administration's plans to lower drug prices as President Trump looked on in the White House Rose Garden. Health and Human Services Secretary Alex Azar has this pen. It's not all that remarkable looking, but he held it up multiple times Monday at a briefing with reporters. "This pen," he said, "has a lot of power." And he said he is prepared to use it. Azar was making the point that in the area of drug prices, the head of HHS — which runs the Medicare and Medicaid programs and buys about $130 billion in prescription drugs each year — can make a lot of changes in the pharmaceutical market. And he doesn't need congressional approval to do it. He's got plans to use that pen to change the way Medicare and Medicaid pay for medications and how the Food and Drug Administration goes about approving drugs for marketing. Lots of the ideas are wonky and esoteric, but analysts say some could make a big difference over the long term. 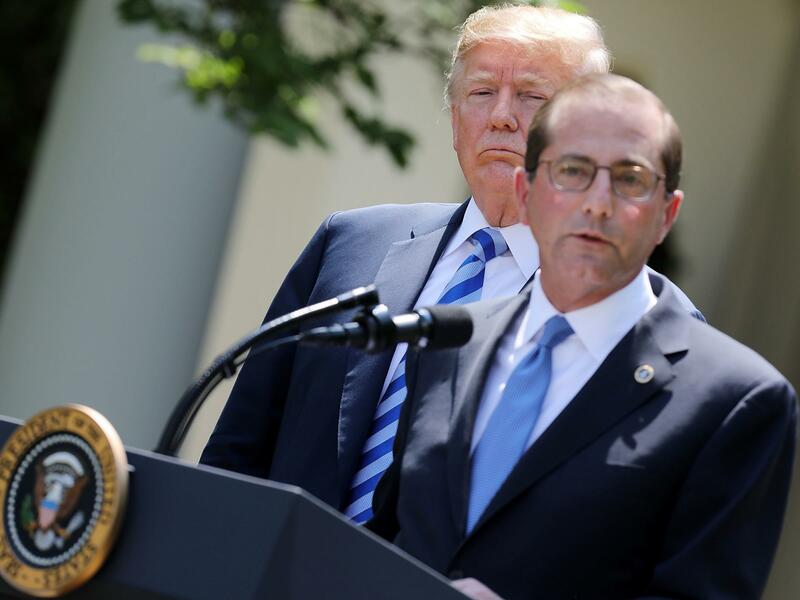 Here are three of the big ideas Azar laid out Monday, three days after President Trump unveiled a blueprint to lower the cost of prescription drugs that was criticized for being light on substance. Azar's most ambitious initiative would ban pharmacy benefit managers — the companies that administer prescription drug plans for insurance companies or employers – from negotiating discounts with drugmakers as a percentage of list prices. Today PBMs, such as CVS Caremark or Express Scripts, make deals in the form of rebates. Pharmaceutical companies offer something like 30 percent off the list price of their drugs if the PBM places the medicines in a favorable spot on their preferred drug lists. When prices go up, PBMs often make more money as rebates grow. "They're taking money from both sides," Azar said. "They've built into their system a regime where they get more money when the list price goes up." Azar said he intends to force PBMs to write contracts based on a set price for drugs, rather than a percentage-based rebate. And, he said, he's looking to ban them from making any money at all from pharmaceutical companies. Instead, the companies would earn money only from the fees paid by the insurance companies or employers who hire them. "This is nothing short of the complete and fundamental restructuring of over $400 billion of the U.S. economy," he said. David Mitchell, founder of the advocacy group Patients for Affordable Drugs, approves of the idea. "If they could do away with the rebates and have transparent net prices, I think that's an enormous step forward," he said. But Express Scripts spokesman Brian Henry takes issue with targeting PBMs. "The root cause is the pharmaceutical companies who set these prices," he said. "We are the ones who help drive down the costs. We drive competition." Azar says he wants to simplify the way Medicare pays for many drugs by moving some expensive medications that are administered in doctors' offices — like cancer drugs — into the standard Medicare prescription drug program. Many of those expensive drugs are paid for through Medicare Part B. It's a system in which doctors buy the drugs and get paid a percentage of their cost to administer them to patients. Under this system, the government pays the full list price and doctors make more money when they prescribe more expensive drugs. Azar said he wants to move some of the most expensive of those drugs to the Part D program, which is administered by private health insurance companies that negotiate discounts with drug companies. "This move from B to D gives us the power to negotiate against drug companies," he said. But analysts caution it could lead to higher out-of-pocket costs and less choice for patients. "Moving drugs from Part B to Part D could get the prices of some drugs down by allowing insurers to bargain with drugmakers, but it would likely come with more restrictions on which drugs are covered," said Larry Levitt, vice president of the Kaiser Family Foundation. "Some Part B drugs — many of which are infusions like chemotherapy — don't have competitors, so negotiation may not help much." The Centers for Medicare and Medicaid Services will release new versions of its Medicare and Medicaid drug price dashboards on Tuesday that HHS says will have more detail on how much the programs are paying for the medications they buy. And on top of that, Azar says he is looking at whether he can require drug companies to include the price of their products in those television ads that already include seemingly endless lists of scary side effects. Mitchell and Levitt both doubt that drug companies can be shamed into lowering prices and losing profit. "It's not going to lower drug prices," Mitchell says. "But it would probably help for patients to know that the drug they're getting costs $100,000." And finally, he wants to get rid of what he calls a "gag rule" in some PBM contracts that forbid pharmacists to tell patients they can get their drug cheaper by going outside their insurance plan. "Note that there are a number of proposals they are suggesting that are controversial and will result in pitched battles," says Rodney Whitlock, vice president of health policy at ML Strategies, a lobbying firm. "That said, they sure are talking a good game and should be given deference that action will approach rhetoric." Azar, who came to HHS after a stint as president of the U.S. operations of the pharmaceutical giant Eli Lilly, opened his talk by dispensing with the industry's long-embraced argument that high prices are necessary to pay for research into future cures. "I've been a drug company executive. I know the tired talking points: the idea that if one penny disappears from pharma profit margins, American innovation will grind to a halt," Azar said. "I'm not interested in hearing those talking points anymore."